Mapping: Drones / UAVs can create detailed, accessible maps through an innovative range of data capture technologies and analytics. DC Geomatics aims to make geographic data more accessible and affordable to a global market by hosting an innovative range of data capture technologies and analytics. Through partnerships and our network of operators we can offer our clients accurate results, detailed maps, and support all the way. 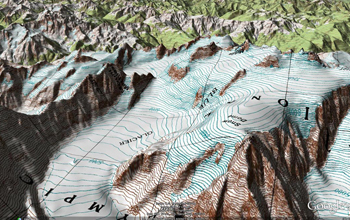 Contour maps are used to draw valuable insights across a number of industries from mining to agriculture. Allowing for rapid surveys over large land areas, UAVs can be used to gather data for the creation of these high-resolution maps for overseeing sites, observing landscape and industry changes, or measuring stockpiles. An important part of precision agriculture, the normalized difference vegetation index (NDVI) is used to analyze remote sensing measurements and assess the presence of live green vegetation. An NDVI UAV allows the operator to quickly and simply crop scout hundreds of acres and get accurate, high-resolution, actionable data. UAVs can form an integral part of a geographic information system (GIS) – a computer system for capturing, storing, checking, and displaying data related to positions on Earth's surface, allowing for mapped out pattern and relationship analysis. UAVs collect data quickly, use fewer natural resources than manned aircraft, and display superior reach.